(Wayne—May 14, 2015) High Tech students shone at the 32nd Annual Orlando Saa Foreign Languages Poetry Recitation Contest, held at William Paterson University, announced Dr. Joseph Giammarella, Principal of High Tech High School. The following students excelled in the French poetry contest: Sara Bendaoud of Bayonne earned second place for advanced level. Other students who entered the French contest included Nicole Albornoz of Jersey City and North Bergen resident Erica De Lacerda. Christian Flores of Union City excelled in the Germanpoetry contest, earning first place for beginner level. North Bergen resident Sherly Tapia entered the Italian poetry contest as well. 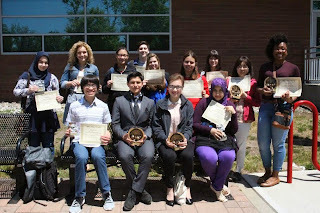 Students also excelled in the Japanese poetry contest: Bayonne residents Taeka Hayashi and Joseph Saylor earned first place for native level and third place for intermediate level, respectively; Camille Romano of Kearny earned first place for beginner level; and Secaucus resident Aaleah Oliver earned first mention for advanced level. 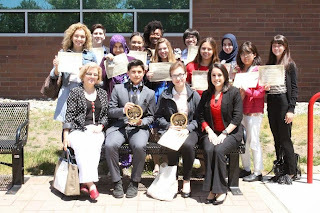 Last but not least, the following students participated in the Spanishpoetry contest: Mariam Abdelmoula of Jersey City, who earned third place for the beginner level; Bayonne resident Ivana Rodriguez; Karina Voronich of North Bergen; and Secaucus resident Zachary Canonico. “All contestants did great work representing High Tech High School,” declares Dr. Laje Gashi, veteran French Language and Culture instructor at High Tech. Sponsored by the Department of Languages and Cultures, the Orlando Saa Foreign Languages Poetry Recitation Contest features competitions in Chinese, ESL, French, German, Italian, Japanese, Korean, Latin, and Spanish.